The Baylor A Cappella Choir is part of the School of Music at Baylor University, Waco, Texas. The present disc was recorded during a visit that the choir paid to Paris in May 2014. The venue for the recording, made under studio conditions, was the Church of St. Etienne-du-Mont and this location was very significant since Duruflé served as organist in this very church from 1929 until his death. In a note in the booklet the Baylor Choir’s Graduate Conductor, Timothy Brendler comments that the choir was the first American ensemble to record the Requiem “in the space and with the instrument at which it was conceived.” His claim may be accurate as far the “space” is concerned but I think he’s stretching the point a bit when it comes to the organ. He himself points out earlier in his very useful essay that when Duruflé took up his post the organ was in a sorry state and in 1938 the instrument was dismantled completely with a view to restoration. War intervened and the rebuild was not begun until 1945. That process lasted until 1954 and even after that further works were carried out until 1991 when the organ became as we hear it today. Therefore, the instrument was completely out of action when Duruflé was engaged in the composition of his Requiem. We might speculate, though, that he may well have had in his head the sounds which he wished to hear from the St. Etienne-du-Mont organ. All that said, I’m very glad that the church was chosen as the venue for two reasons. Firstly, the recording itself is a very good one and the recorded sound conveys the ambience of the building and the sound that the choir makes there most successfully. Secondly, though the organ differs nowadays from the instrument on which Duruflé played, it makes a fine sound and it is superbly played by Isabelle Demers. She is the Associate Professor of Organ at Baylor University. I mention that fact because she is, presumably, resident in Texas and I wonder how much time she had to familiarise herself with the organ in St. Etienne-du-Mont. To my ears it seems as if she has mastered it completely and I admired her playing greatly. The sounds that she conjures from the instrument are consistently apt without ever drawing the listener’s attention away from the singing. Some of the registrations are wonderful: sample, for example, the fascinating reedy sound she draws from the organ in the introduction to and during the first baritone solo (track 4, from 5;22). Throughout the performance there is a sense that everything to do with the organ part is ‘right’. Bravo! I liked, too, the sound that the choir makes. I presume that most if not all the singers are students. There’s a nice freshness to their singing and, following in the vocal score, I admired the attention to detail; this is a well-prepared choir. Only once was I truly disappointed. In the ‘In Paradisum’ movement when the full choir enters at ‘Chorus angelorum’ the dynamic should be pp but what we hear is close to mf; it’s much too loud and robs the passage of its essential mystery. That apart I enjoyed the alert and committed choral contribution very much. The boat was pushed out in the choice of soloists. Quinn Kelsey sings his two solos well. 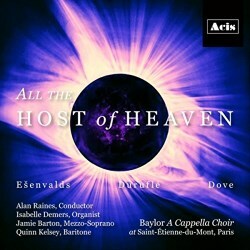 Jamie Barton, here recorded a year after winning the Cardiff Singer of the World competition, brings lustrous tone and no little ardour to ‘Pie Jesu’. However, some may feel that hers is just too rich a voice and her approach a bit too operatic for this music. In general Alan Raines is a sure-footed guide to the score and conducts with evident empathy for the music. For most of the time he achieves a good flow and, as I indicated earlier, it’s evident that he has prepared the choir very thoroughly. My only reservations are firstly that sometimes he makes a little too much of some of the ritardandi and, secondly, that his pacing of the ‘Lux aeterna’ is a bit too slow, especially those passages where first the sopranos and tenors and, later, the altos and basses deliver the words in unison all on one note. But even then, I must qualify that reservation by acknowledging that Raines secures a performance of the movement that is gently radiant in tone. There are many fine recordings of the Duruflé Requiem in the catalogue and, in all honesty, I can’t say that this challenges the best. However, it’s still a performance that’s well worth hearing and I enjoyed it. In my experience most recordings of the Requiem couple it with more music by Duruflé or with other French pieces. The selection of works by Ĕriks Ešenvalds and Jonathan Dove is, therefore, very enterprising: furthermore, both of these pieces are extremely fine ones. There’s a common theme in that both pieces refer to stars and there’s a lot to be said for using them as musical “bookends” to the main work – though there’s also a case to make that one doesn’t want to hear anything else after the Requiem’s last chord has faded into silence. Both pieces are highly imaginative and they’re expertly performed here. The recorded sound is very well managed and the documentation is pretty comprehensive with the caveat that nothing whatsoever is said about the Ešenvalds and Dove pieces.